U.S. Navy operations specialists monitor radar in the combat information center aboard the USS Bataan. New technologies that improve intelligence, surveillance and reconnaissance are part of the Defense Intelligence Agency’s (DIA’s) prescription for better intelligence in the Global War on Terrorism. The war on terrorism and the community reorganization generate a controlled upheaval. The unforgiving world that has taken shape after September 11, 2001, is changing both the nature of defense intelligence and its means of operations. Virtually every aspect of intelligence operations—collection, processing, analysis and dissemination—is changing to address new global threats and the transformation gripping the national security community. Lt. Gen. Michael D. Maples, USA, is the director of the Defense Intelligence Agency (DIA). He also is the director of the Defense Joint Intelligence Operations Center (DJIOC), the defense human intelligence (HUMINT) manager, and the commander of the Joint Functional Component Command for Intelligence, Surveillance and Reconnaissance (JFCCISR) for the U.S. Strategic Command (STRATCOM). These diverse roles parallel the multifaceted nature of defense intelligence in the post-9/11 era. As with so many defense organizations, the DIA must conduct ongoing operations in the Global War on Terrorism concurrent with transformation changes confronting the agency. It cannot falter in either, the general states. As a result, its resources are stretched and it must establish priorities for its global operations, which are not limited to the war on terrorism. The agency has had to re-evaluate its capabilities with a greater focus on irregular warfare, the general continues. He expects that it will be engaged in irregular warfare for the foreseeable future, and this places a different level of emphasis on analysts and their products. The DIA has been working on several new technologies that will help develop vital intelligence in ungoverned areas, the general notes. These are the areas where adversaries tend to operate, and the intelligence community needs a new suite of collection and measurement and signature intelligence (MASINT) capabilities to obtain the necessary information on adversaries in these areas. MASINT can be particularly important for detecting ballistic missiles, directed energy weapons and weapons of mass destruction, Gen. Maples offers. “These are three areas where we must sustain our investment in MASINT,” he declares. “Having signatures and a signatures program is going to become increasingly important to us. We are going to have less opportunity to see or hear, but we will have an ability to measure to a greater extent. The U.S. defense strategy’s renewed focus on global shaping operations is affecting operations at the DIA. This more proactive approach to global engagements—shaping situations first on U.S. terms instead of reacting afterward on an adversary’s terms—requires the defense intelligence community to develop different kinds of intelligence and information for combatant commanders. This includes a new understanding of cultures and leaders and their decision making, which is a different realm than the one on which field commanders currently depend. The changed strategic environment is the greatest impetus for change at the DIA, the general says. This new environment takes the agency out of its traditional organizational constructs and staff processes. Instead of being oriented toward its organizational construct of service and agency intelligence, the DIA is moving toward joint intelligence operations centers (JIOCs). This represents a networked approach to linking the capabilities of defense intelligence. “It [the changed strategic environment] puts us—particularly with information technology—into an operational construct where networking is central to our ability to be successful,” he emphasizes. That change is making itself apparent in ongoing operations in Iraq and Afghanistan, the general continues. The greatest successes have come from multi-INT approaches in which information is being provided rapidly to lower tactical levels. This permits operators to exploit that information to conduct rapid missions in succession. “We are spending less time analyzing that information and more time acting on it,” he declares. Networking intelligence capabilities involves bringing together representatives from all of the intelligence agencies and disciplines. The intelligence disciplines enable one another using information technology as a tool to make that happen, the general explains. The DIA is the executive agent for the NationalMediaExploitationCenter, and the agency has media exploitation capabilities forward in both Iraq and Afghanistan. They are being moved to lower tactical levels so that forces can take advantage of documents and other media found on the scene. That valuable information must be turned around rapidly, Gen. Maples points out, because adversaries react quickly when they learn that key information has fallen into U.S. hands. He describes this lower level media exploitation facility as a type of mini-JIOC in which various intelligence capabilities are co-located or networked for effective exploitation. At the national level, the DJIOC strives to accomplish the same goal, the general suggests. It tries to understand the intelligence needs of combatant commanders and to address shortcomings. The DJIOC is co-located with the JFCCISR, and the two have integrated their operations into a single global intelligence operations center. This brings together the understanding of combatant commanders’ intelligence needs and priorities along with the ability to meet those requirements using global intelligence, surveillance and reconnaissance (ISR) assets. The result is the formation of a global common operating picture of how ISR resources and national capabilities are being applied, and this allows the general to see shortfalls and redundancies. He then can recommend the reallocation of resources to redress the shortfalls. Gen. Maples believes that many gains have been achieved through the Intelligence Reform Act of 2004, which created the office of Director of National Intelligence (DNI) as a capstone to an intelligence community consolidation effort. With many basic goals attained, the community now must address some more difficult challenges, the general offers. Ongoing operations have helped highlight where conflicts exist in guidance, policies, processes and procedures. The intelligence community is beginning to root out those conflicts to apply community solutions. This contrasts with adapting traditional constructs with simple overlays that do not really address the problem—which had been a way of doing business for many years. 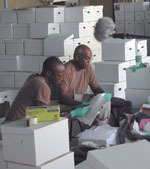 Members of the Iraq Survey Team pour over boxes of documents seized when allied forces toppled Saddam Hussein. Being able to translate and disseminate intelligence rapidly on enemy documents and other media is a key capability for defeating the insurgency in Iraq. As an example of encouraging progress, Gen. Maples cites how Gen. Michael Hayden, USAF, head of the Central Intelligence Agency, also is the national HUMINT manager in charge of the National Clandestine Service. Gen. Maples is the defense HUMINT manager with the defense component of the National Clandestine Service. They have a team rewriting Intelligence Community Directive 304 to take a fresh look at how to employ HUMINT resources in an integrated, collaborative manner with common standards and training. This will be framed against the context of the irregular war on terrorism, and similar efforts may lie ahead for collection architecture and the analytic community, Gen. Maples suggests. The past two years have seen the establishment of a structure for cooperation that the general describes as “a confederated state on the verge of bringing about the integration of our capabilities.” The community also is poised to make changes in the policies and programs that are interfering with the ability to achieve that integration. “We’ve gone far enough to understand what the limitations are and what we have to change next in order to take the next step,” he declares. Foremost among these is information sharing. The advantages of network centricity are lost if information is not shared, and this faces both technological and cultural obstacles. Tagging data heads the list of enablers to permit intelligence access and sharing, the general states. He has that responsibility for the Department of Defense Intelligence Information System (DODIIS), which involves consolidating 11 separate enterprises into a single collaborative grid. The next 18 months should begin to show the advantages of this enterprise approach, he predicts. The need for metadata tagging crosses all domains of the defense community. In addition to the data tagging effort underway with the DODIIS, the DIA is working with the Office of the Assistant Secretary of Defense for Networks and Information Integration (ASD NII) to establish common data standards. The DIA also is involved with the DNI, and the directors of the combat support agencies—the National Security Agency, National Geospatial-Intelligence Agency, National Reconnaissance Office—have their chief information officers working together on this challenge. In his role with STRATCOM, Gen. Maples is working on a program to set up demonstrations for moving sensor data to storage. The focus is on how that data is tagged and delivered to the user who needs it. That effort currently is concentrating on imagery, but it will expand into other forms of intelligence data. The DODIIS trusted workstation will provide cross-domain collaboration between the secret Internet protocol router network (SIPRNET) and the Joint Worldwide Intelligence Communications System (JWICS), and it will permit more analysts to access unclassified networks. This will clear the way for more open-source intelligence capabilities, the general notes. The DODIIS trusted workstation and thin-client workstations can provide access to multiple networks and operating environments. Gen. Maples relates that while DIA personnel generally are operating on JWICS, most people conducting operations are using the SIPRNET. Being able to move data easily across those networks is an important goal, he emphasizes. The warfighting Global Command and Control System–Integrated Imagery and Intelligence, or GCCS-I3, is a foundation for what the DIA is trying to achieve in JIOCs, the general states. This system provides visualizations from a wide range of intelligence and operational professionals from the national level down to the tactical level. It will be the intelligence module of the Defense Information Systems Agency’s (DISA’s) next-generation command and control system. It will allow the DJIOC, the JFCCISR and all of the combatant command JIOCs to have access to common visualizations and tools. This will permit better intelligence support to operations in a networked environment, he emphasizes. Among the DIA’s requirements are intelligent data systems that would permit a user to register for the kinds of information and data that are needed. When that information hits the collective system, it would be routed automatically to the users who need it. The “pull versus push” intelligence debate largely has been decided in favor of “push.” Rather than users or analysts searching for needed information, systems are being established to move that information to them when they need it. “Instead of [analysts] needing to ‘Google’ that information and search for it, they can spend more time on the production function, which is what we really want our analysts to be able to do,” the general offers. The DIA’s activities in this realm must link to the intelligence community as a whole as well as to what the services are achieving from the tactical level up, he continues. This effort includes an all-source approach to intelligence tools. One program, ALIEN, involves an all-source intelligence network that integrates commercial search and discovery applications, advanced link analysis, secure visualization capabilities and a cross-domain search capability called the multidomain dissemination system (MDDS). ALIEN will create a single database that will allow users to access real-time data where it resides. They will be able to use advanced network-centric analytic tools that the general describes as cutting edge. Again, common data standards may be the key to success in this endeavor. Data tagging and database integration within the DODIIS should achieve significant goals by this summer, and then that integration will be expanded to include the services, the combat support agencies and the national intelligence community. The DIA always is looking for cutting edge technologies, the general states. These include unattended ground sensors that can cover areas and provide information in regions where HUMINT is lacking. Collection technologies that focus on the difficult environments characteristic of irregular warfare are high on the wish list. Other technologies directly relate to new tools for HUMINT personnel, particularly those that involve translation and human contact. Combatant commanders also want technologies for areas in which they want to operate but do not have capabilities for understanding the situation on the ground. The DIA is engaged in research and development for these types of capabilities, Gen. Maples adds. For the DJIOC, technology needs might include enablers for integrating intelligence capabilities along with the kinds of tools that permit collaboration. Another need is for analytic tools that will allow reducing a huge volume of information to a manageable size for distribution to the right consumers. Intelligence also must be displayed with visualization tools that provide a common picture. And, tools that will provide a training advantage are on the general’s list. The DIA must train its professional work force and sustain its knowledge and skills regardless of when these professionals are brought into the work force. This month, the DIA will dedicate a joint center of excellence for HUMINT training at Fort Huachuca, Arizona. A newly drafted DIA HUMINT directive addresses how defense HUMINT will operate. However, these defense HUMINT steps represent early stage efforts. Much remains to be done for defense HUMINT, the general allows. He states that he would like to move further and faster to recruit HUMINT operators and support personnel. The DIA has brought the right kinds of expertise onboard, but proficiency in foreign languages remains a challenge for recruitment. Adjudicating security clearances is a roadblock to effective recruitment, especially with good candidates who may have family overseas. That can be addressed in ways that guarantee the security of the nation’s secrets, the general allows.